Let’s talk about how to find cheap flight deals because that is how we travel around the world! And yes, there are some hacks that you need to know to nail this art! Take this advice and our tips on how to travel cheaply to learn even more! 1 You need to know where to look for the cheap flight deals. 2 You have to be flexible to learn how to find cheap flight deals. 3 You have to LOVE multiple and/or long layovers. 4 You have to travel when no one else does. 5 Be smart to find cheap flight deals. You need to know where to look for the cheap flight deals. Whenever you are looking on how to find cheap flight deals, do not go directly to your favorite airline website. Rather use one of the metasearch engines to compare prices of different airlines. The most popular engines to use – skyscanner , kiwi, kayak, and momondo. Yet, it still might take you a long time to find the best deal, even though you are scrolling through every available combination of dates and times. Bear with us. Thankfully, there are many great people out there who have done the search for you, so you just have to browse through the offers they provide and pick your next holiday destination. Check out such sites as – fly4free , travelfree , flynous , holidayguru etc. these guys are doing us all a big favour! They daily list deals for different destinations, price ranges, last-minute, early bird and others. Fundamentally, they gather deals from all the airlines, including error fares, which tend to be ridiculously cheap. We’ll give you an example – a one-way ticket to Bangkok, Thailand from Copenhagen, Denmark cost us € 110 ($128) p.p., roundtrip from Brussels, Belgium to Guatemala via NYC and via Texas, US set us back € 330 ($ 384) p.p. Be prepared that error fare tickets are gone fast so you have to check the deals daily. If you see something you love you have to act fast. We have implemented the ticket hunt in our morning routine, with a cup of coffee. Follow airline promos on the same above sites, often a concrete airline will do a sale on all their flights, whatever the destination, for example, all AirAsia, Emirates, Etihad, or United etc. flights. Often you will have to book from a German, Italian or Spanish site because the deal will be only available on their local sites and will be gone as soon as you change the site to English. You have to be flexible to learn how to find cheap flight deals. First book your tickets, then book your vacation days at work. If you have already taken your vacation days and only now searching for some great deals, chances you’ll find something are pretty slim. You won’t be able to fly out on Monday morning and come back Sunday evening either. Those are the busiest times at the airports as people who travel for work make their way to work and vice versa. Be ready to fly out Tuesday midnight and arrive at your destination at 6am. It’s the perfect timing for no one to want to be at the airport, especially those who can afford to arrange their flights for whatever price. We want them cheap so we walk the extra mile. When you are flying to a country/city, consider all the nearby airports as oftentimes budget airlines use designated airports slightly out of the city but the flights are very, very cheap. For example, if you would fly to Barcelona (BCN) check out the nearby Barcelona Reus. When flying to New York City, instead of choosing overcrowded JFK New York Airport opt for New York Newark Liberty (EWR) which is equally close to NYC center. Brussels Airport has some cosy sofas and it tends to be quiet overnight, how to find cheap flight deals – they come with a cost! You have to LOVE multiple and/or long layovers. Gotta give some to gain some. Most of the time cheap flights are so cheap, because no one who has the resources, would want the hassle of long layovers and endless hours at the airports. We love that! That is what makes the cheap flight deals so cheap! And, let me be honest with you, long layovers and wandering around airports can be fun! Try all your favorite perfumes and cosmetics. Go buy some booze at the tax-free and drink it while waiting. Best of all -just get some work done. There are plenty of things to do, Singapore Changi Airport even has a pool and sunbeds on the roof! You have to travel when no one else does. Okay, okay, I am exaggerating. But note this: choose to go when it is the low season at your destination. And remember to stay away from international holidays. Obviously, tickets to Brazil will cost you a kidney the least, if you decide to go around Rio Carnival time. I am not saying you cannot hunt down a great cheap flight deal for that time. Yet it will be way more difficult. The same applies to Christmas, New Years, Thanksgiving (US) and the whole month of July worldwide. Why July? Because the school’s over, Uni’s over and most of the people go on vacation right then. Be smart to find cheap flight deals. Do some research beforehand, know where you want to go (approximately), but do not set a concrete destination though. Pick at least 3 so you have several options when searching for the deals. Research when is the low season for your destination, but at the same time, the weather is not terrible. I suggest opting for shoulder seasons between high and low tourism periods. Do not go to travel agents or third parties that charge fat commissions. You will definitely be better on your own. Last but not least, when searching on skyscanner or momondo go incognito! For Google Chorme go to settings and new incognito window. This helps to avoid cookies remembering your past search results. Cookies automatically increase the prices if you look at different options and combinations for more than once. Them computers are smart, but you are one step ahead! Cheap flights deals are not so hard to find if you learn how to! Happy ticket hunting, let us know how you did! If you need some help, just let us know! Use Booking.com for your hotel reservations! Get 30 € off your first AIRBNB stay here! 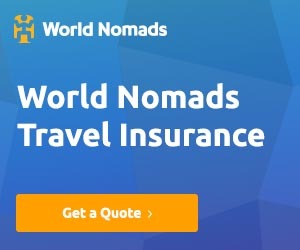 Do not forget to get travel insurance! World Nomads is the best one out there!